I have been saving Crew's formula cans for the last couple months in hopes to find a clever way to use them. Then while looking for cute goody packaging ideas I saw the idea of using the formula cans for our Christmas goodies this year. I just wrapped a 4" thick strip of wrapping paper around them and cut a circle for the lid (to cover the Enfamil label). They were just the right size, and I was able to cram a lot of stuff into the cans. I made matching bows out of coordinating wrapping paper using this tutorial I found on Pinterest. For the goodies, I kept it relatively simple. I dipped some Oreos in white chocolate and put Landon to work making our version of "bulls eyes"(snap pretzel + Rolo + peanut butter m&m). The "hardest" thing I did was make this toffee. I was surprised at how simple it was to make, and it turned out SO SO SO good! I threw in some Butterfinger Bells (for the kids, since I do not believe in sharing Ghirardelli with children) and topped it off with a few Lindor Balls. We had a blast looking at Christmas lights while passing out the cans to our friends and neighbors. Landon has 4 teachers this year... So since I didn't have enough cans, I decided to make some of the cute paper gift boxes I've seen on Pinterest. I used this tutorial and can't stop making these! I even made some mini ones for part of my YW lesson last Sunday. I used 12x12 cardstock and filled the teacher boxes with toffee. 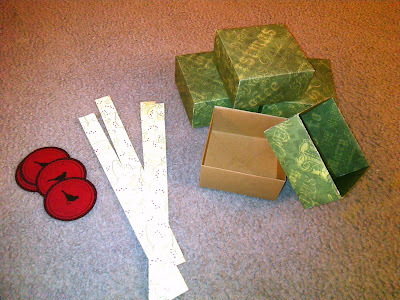 I made the labels on Picnik.com and cut strips of scrapbook paper to "tie" the box closed. CUTE. I want to be his teacher. YUM! I want to make those boxes.